2019-02-06 11:31:542019-02-06 11:31:54https://quickbooks.intuit.com/in/resources/finance-and-accounting-cash-flow/cash-flow-statement/Finance and Accounting: Cash FlowEnglishCash flow statement represents your entity’s cash inflows and outflows for a specified period. 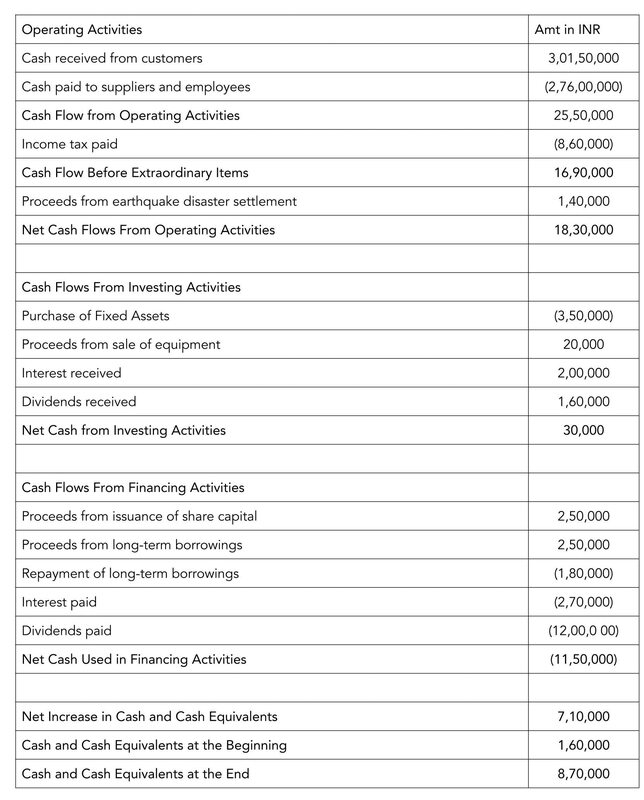 Here's a detailed guide on what is cash...https://quickbooks.intuit.com/in/resources/in_qrc/uploads/2019/02/Small-Business-Term-What-Is-Cash-Flow-Statement.jpghttps://quickbooks.intuit.com/in/resources/finance-and-accounting-cash-flow/cash-flow-statement/Small Business Term: What is Cash Flow Statement? financial statements of other entities. Given this, cash flow is the third accounting report that your business must prepare . So what is a cash flow statement? And what is the purpose behind preparing such a statement? needs of your enterprise to utilize those cash flows. Cash flow is prepared in addition to your entity’s balance sheet and income statements. The purpose behind preparing cash flow statement is simple. Your income during a period has no direct relationship with cash flows of that period. This is because income statement represents economic results of your operating activities during a said period. Also, the key concepts applied while measuring income are revenue recognition and matching of expenses. Accordingly, revenues and expenses are recognized in the period in which your business transactions occur. And such transactions are recorded irrespective of whether cash was paid or received at that time or at a later date. Therefore, it becomes important to prepare cash flow statement separately. A cash flow statement reflects inflows and outflows of cash from various activities of your business during a specified period. The fundamental objective of a cash flow statement is to provide data about cash flows from operating, investing and financing activities of your business. This information is useful to multiple stakeholders of your company. It helps them in assessing your entity’s ability to generate cash and cash equivalents; the timing and certainty of such cash flows. Additionally, it makes them aware of your enterprise’s requirement to utilize those cash flows. Based on the information thus collected, the stakeholders take economic decisions. Your business needs cash. This is because cash helps you to conduct operations, meet financial obligations and provide returns to owners. A cash flow statement gives a snapshot of your entity’s sources and uses of cash during a specified time. So let’s understand why is it important to prepare a cash flow statement. (iv) its ability to generate cash flows. It helps them to adapt to the changing state of affairs and opportunities. 2. Your cash flows do not get affected by different accounting treatments and accruals. Therefore, it is difficult to manipulate information. Now, this helps to improve comparability of information regarding operating performance of different entities. 3. Additionally, cash flow statement helps users in making cash flow projections.This further helps them in developing models for comparing present value of future cash flows of different entities. 4. Furthermore, a cash flow report helps your business in balancing cash inflows and outflows. This allows you to adapt to changing circumstances. Since cash flow is used in conjunction with other financial statements, it helps in examining the relationship between profitability and net cash flow. 5. Lastly, it gives a fair view of the impact of changing prices on the cash flows of your business. What are Cash and Cash Equivalents? As defined earlier, cash flow statement highlights the inflows and outflows of both cash and cash equivalents from different business activities of your entity within a certain period. According to Indian Accounting Standard (Ind AS) 3, the term cash stands for cash in hand and demand deposits with banks. Whereas, cash equivalents represent short-term highly liquid investments that can be readily converted into cash. Such investments are low in risk as they are not subject to material changes in value. Also, these have a short maturity period of three months or less. For instance, short-term marketable securities are treated as cash equivalents. This is because these are highly liquid and can be converted into cash readily. interest received on account of loans given are all cash inflows. On the other hand, cash outflows arise from the payments made towards your business’ operating, investing and financing activities. Examples of cash outflows include cost of goods sold, interest and principal payments and purchase of fixed assets. Cash flows arising from varied business activities of your enterprise are the focus of attention of a cash flow statement. Such activities are classified into three categories: (i) operating, (ii) investing and (iii) financial activities. These activities do not include financing and investing activities. Thus, cash from operating activities helps stakeholders in assessing the level of solvency of your business. It indicates the ability of your business operations to generate cash. This further helps your business to maintain its operating capability and meet its financial obligations. Such obligations include making new investments and repaying loans. as well as investments not considered as cash equivalents. Such outlays are mandatory. This is because these expenditures help in maintaining the operating capacity of your business. These activities relate to purchase and sale of long term assets or fixed assets such as plant and machinery, land building etc. investments in joint venture or affiliates. In addition to changes in long term assets, capital expenditure calculation also includes depreciation. This is because depreciation changes the net of property, plant and equipment. Separate footnote disclosures should be used to showcase assets and liabilities obtained or relinquished in acquisition or divestiture. Financing activities refer to the capital or long-term funds of your business.These activities are the outcome of changes in the proportion and structure in the owner’s capital and borrowings of your business. The elements of cash flow from financing activities include (i) inflows from additional borrowing and equity financing and (ii) outflows for repayment of debt, dividend payments and equity repurchases. Extraordinary items are not regular in nature. These are non-recurring items. Hence, cash flows related with such items should be classified and disclosed separately. Loss due to theft is an example of an extraordinary item. Such items are declared separately as originating from operating, investing and financing activities. This is undertaken to enable the users of financial statements to understand the essence and impact of such items on the current and future cash flows of your business. If your main business is that of lending and borrowing, then interest paid, interest received and dividends received are categorized as operating activities. Whereas, dividend paid is a financing activity. However, if your main business does not relate to lending and borrowing, then payment of interest and dividends are categorized as financing activities. While receipt of the same will be categorized as investing activities. As a business, you pay a host of taxes such as income tax, dividend tax and capital gains tax. Thus, all the cash flows arising out of taxes on income should be disclosed separately. Moreover, such cash flows should be classified under operating activities unless these can be specifically identified with your investing and financing activities. Non-cash transactions include those of your financing and investing transactions that do not require use of cash or cash equivalents. Such transactions should be excluded from your cash flow statement. For instance, procurement of machinery by issuing equity shares. Such non-cash transaction should be recorded elsewhere in the financial statements. These transactions should be recorded in a way that it represents all the relevant information about investing and financing activities. Operating activities are the primary source of revenue generation and expenditure in your business. Thus, you should pay special attention your business’ operating activities. Cash flows from operating activities should be reported by using either direct method or indirect method. However, you should not consider certain items. Non-cash items like depreciation should be written off. And items categorized as investing or financing activities like interest received should not be considered in the direct method. The reporting of investing and financing activities under the indirect method is just like the direct method. 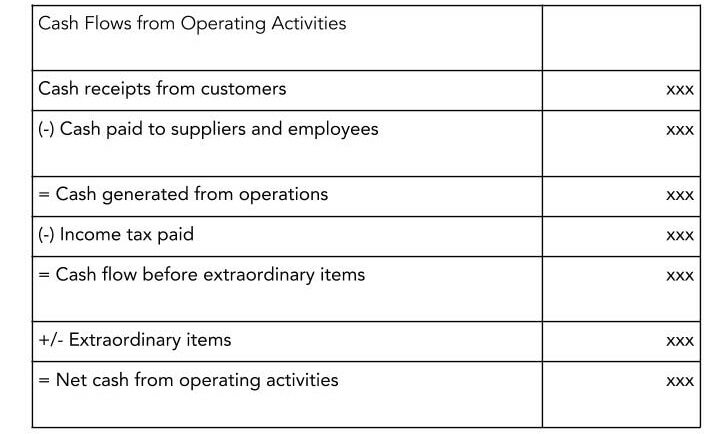 However, the reporting of cash flows generated from operating activity is quite different. Under the indirect method, the ascertaining cash flows from operating activities begins with your company’s net profit or loss. This is so because the income statement incorporates the effects of all operating activities of your business. But your income statement is prepared on accrual basis of accounting. Moreover, it includes certain non-cash items like depreciation and non-operating items like interest paid. Therefore, it becomes necessary to adjust the amount of net profit or loss for all such non-cash, non-operating items. Besides adjusting your non-cash, non-operating items, there are other important adjustments that need to be made to the net profit/loss. These adjustments relate to changes in your working capital. Hence, to calculate the amount of net cash flow from operating activities, the increase in current assets and decrease in current liabilities are deducted from the operating profit. Whereas, the decrease in current assets and increase in current liabilities are added to the operating profit. The reporting of investing and financing activities under both direct and indirect method is exactly same. You just need to showcase the major items of gross cash receipts, gross cash payments and net cash flows from investing and financing activities separately. These items should be represented separately under the headings “Cash Flow from Investing Activities” and “Cash Flow from Financing Activities” respectively. To understand the preparation of cash flow statement, let’s consider the income and expenses of JS Bike manufacturers as of March 31, 2018. To start with the direct method cash flow, you need to review the operating income and expenses undertaken by JS Bikes in cash. This is done by assessing the balance sheet and income statement of JS Bikes. Consider the footnotes also if there are any. Say for instance, after considering trade receivables at the beginning and end of the year, the cash received from customers turns out to be Rs 3.015 Cr. Similarly, cash paid to suppliers and employees after considering trade payables & inventories at the beginning and end of the year stand at negative Rs 2.760 Cr. Then, to arrive at net cash flow from operating activities, you need to adjust income tax and extraordinary items. 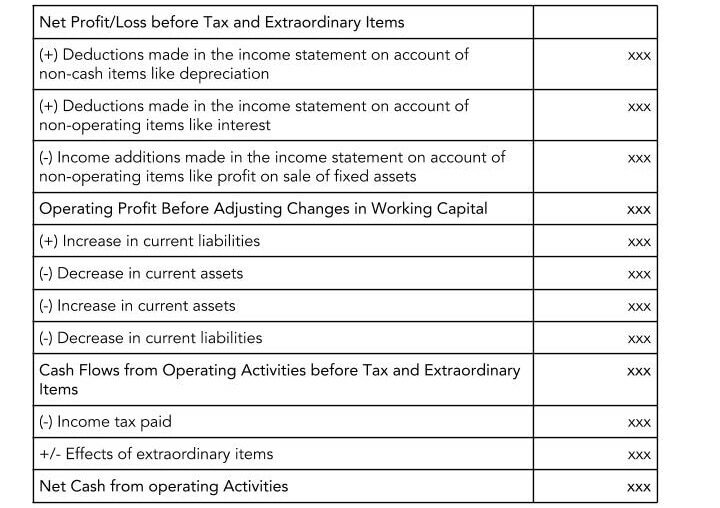 After reporting cash flows from operating activities, the next step is to assess income statement and balance sheet items for reporting investing and financing activities. For instance, the company issued shares of Rs 2,50,000 in 2018 and borrowed funds through long term loan of Rs 2,50,000. Also, the company acquired fixed assets worth Rs 3,50,000 and sold equipment at Rs 20,000. Finally, cash flows from operating, investing and financing activities are added to the cash balance at the beginning of the year. What we get is the cash and cash equivalents at the end of 2018 for JS Bikes. For indirect method cash flow, the reporting of investing and financing activities will remain the same as direct method. However, to calculate cash flow from operating activities, you need to begin with Net Profit/Loss for JS Bikes. The same stands at Rs 33.90 Lakhs at the end of 2018. Then, you need to start adjusting the non-cash, non-operating items in the Net Profit. For instance, depreciation that stands at Rs 4.50 Lakhs is added back to the net profit because its a non-cash items. Similarly, dividend income and interest income are subtracted from the net profit as these are cash flows from investing activities. Finally, the interest expense of Rs 4.00 Lakh is added back to the net profit as it is a non-cash item. After adjusting for non-cash, non-operating items, you need to adjust for changes in current assets and current liabilities. What you finally arrive at is the cash flow from operating activities. Small Business: How To Write A Business Plan?